Update: the pattern is now free to download from Ravelry! We’re talking selling here, not buying! I have just posted my first pattern for sale on Ravelry, after having it declined – in the kindest way imaginable – by the folks at Knitty. You know, I wasn’t really disappointed when it didn’t make the cut. I had already decided to offer the pattern for sale, and by the time I heard back from them, I was ready to get on with it. Because the terms for submission to Knitty specify that no pictures of the pattern can appear anywhere in public before they decide whether or not to publish it, I haven’t written anything about the design here, so now I’ll make up for that. I can usually remember what triggered a design idea for me, but not this time. Suffice it to say that I have wanted to play with Bavarian twisted stitch patterns for some time (such intricate tiny cables! ), and decided to see how that would mix with a bit of Fair Isle color pattern. So I went stash diving and came up with my favorite deep teal blue for the main color, with a bit of natural white and rusty pumpkin orange for contrast. 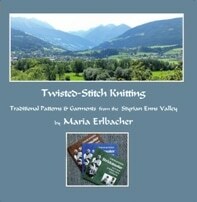 The biggest question was how to relate the two well-known regional knitting traditions to each other. After poking around in my sources, relying heavily on Twisted-Stitch Knitting by Maria Erlbacher, and a bit of chart tweaking, I settled on appropriately scaled oval-and-diamond motifs for both the color pattern and the twisted stitch pattern. Then it was just a matter of narrowing the field of complementary twisted stitch patterns that were the right width to produce a good sock circumference. Next was the actual sock knitting, pleasantly entertaining in itself, but which came with the annoying need to document every step. Normally, I simply jot down enough notes to make sure the second sock comes out the same size as the first, and don’t worry about explaining how I did everything. That was not going to do it this time. I tried to be good, counting and keeping track and writing, and then checked my work by following those notes for sock #2, editing and correcting as I went along. Then came the hard part – trying to put it in terms that someone else could understand! Followed by another hard part – editing the pattern (terminology, format, etc.) to fit the submission requirements. I got it sent off, and then waited a couple of months for the outcome, and getting ready for Plan B, which turned out to be a good thing. At long last, here is the result: A Twist of Fair Isle!